Having your own herb garden is a thing of beauty. There’s nothing better than fresh herbs to enliven even the most bland dish, but not everyone has garden space for an herb garden. Luckily, most herbs do very well grown together in containers. Mixing herbs in a pot isn’t as easy as it sounds, however. There are some general rules of thumb when growing herb plants together. Read on to find out what herbs will grow in one pot and other helpful information about growing herb plants together. Be sure to choose plants with common irrigation needs when mixing herbs in a pot. While pretty much all herbs love sun, some have more water requirements than others. For instance, rosemary, thymeand sagelike it fairly dry, but tender basiland parsleyneed more consistent moisture. Also, if you know that you are forgetful and likely to miss a watering here and there, you might want to select only those herbs that are drought tolerant. Plant mintby itself. All mint has a tendency to rampantly grow over and into other plants’ space. 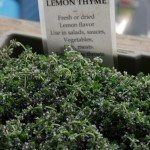 Be careful about which mint varieties are grown together. For example, if you plant a lemon mint with spearmint, they might cross pollinate. While this might turn out to be an interesting experiment, the results might be less than palatable. Moisture loving herbs such as tarragon, cilantro, and basilshould be grouped together. Parsleyshould be included as well but be aware that parsley is a biennial and will die back after 2 years.